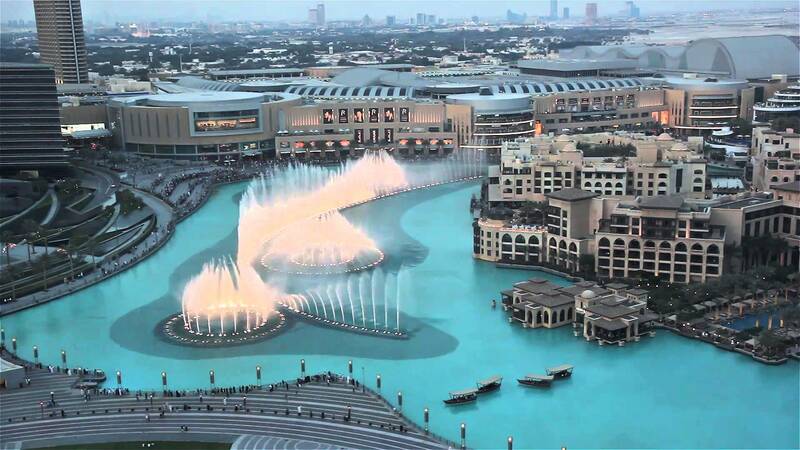 Set on the 30-acre Burj Khalifa Lake, the fountain shoots water jets as high as 500 ft (150 meters), equivalent to that of a 50-storey building. The fountain is 900 ft (275 meters) long and has five circles of varying sizes and two central arcs. It has been designed by California-based WET, the creators of the Fountains of Bellagio in Las Vegas. Over 6,600 WET Superlights – the most advanced incandescent large fountain lights available today – and 25 color projectors create a visual spectrum of over 1,000 abstract attractions. The beam of light shining upward from the fountain can be seen from over 20 miles away, and will be visible from space making it the brightest spot in the Middle East, and quite possibly in the entire world.